When I first visited Istanbul in 2005, by guide-book downplayed the 16th century Suleymaniye mosque in favor of the Blue Mosque and Hagia Sophia. I think that is a mistake. 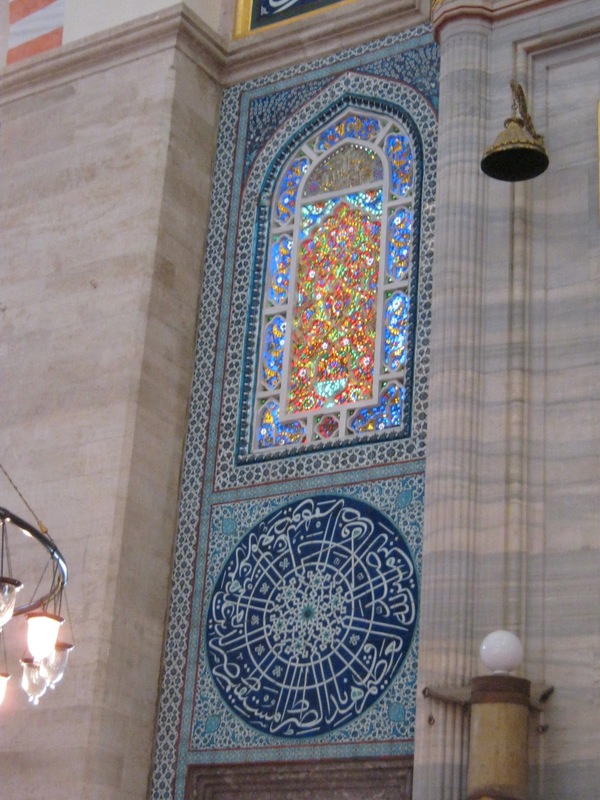 In fact, the Suleymaniye mosque somehow creates a nice balance of splendor and modesty at the same time. Built in 1558, the genius of the Sinan's architecture in this mosque is hidden in the details and the interior decorations are relatively simple. On my last trip to Istanbul, the mosque was closed for renovation. But now the main part of the mosque is open and the newly renovated colors (including that of red marble) really stand out. Here are some pictures to give you a taste. But you can also take a fantastic 3D tour of the interior of the mosque at this website. This is a view from the mosque courtyard. Here you have the Bosporus minarets and a satellite dish. A glimpse of Sinan's mosque architecture. The main dome of the mosque. Also, note the bright red marble in the arches. You can see one of the arches more clearly here. In addition you can see one of the side domes. There isn't too much tile work and frescos in Suleymaniye. But here is an exquisite example from the front side of the mosque. I think Ataturk must be frowning at the construction-truck blocking the view of the Bosporus. Saturday Video: Just how small is an atom?